The colour primaries used are defined in xyY space. These are the primaries specified by both ITU-R BT.709 and sRGB. Given these chromanicities, we are given a relationship between the coordinates and the values of , , and . For example, the value of any colour can be expressed as a linear combination of the values for , , and individually. Since we can derive those from the chromanicities, we define constants , and to represent the factors of which the chromanicities contribute to the resulting value. To solve these values, I'm using the notation and ideas from the method described in Foley/van Dam. In order to compute the values of , and , we need a known reference point. For this we will use the D65 white point (black body at 6500K) and use unity luminance ( ) and map this to . The matching functions are created by converting the xbar, ybar and zbar quantities to sRGB-space. 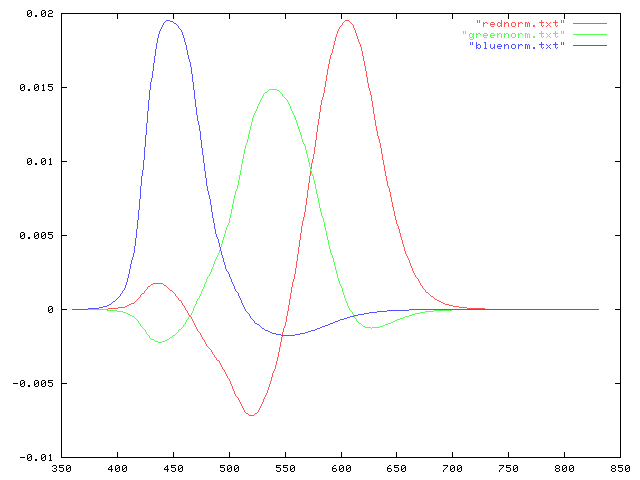 Raw version, relative sensitivity on the y axis, wavelength in nanometers along the x axis. 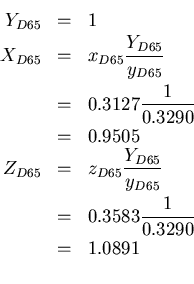 Normalized version such that each integral sums to unity. 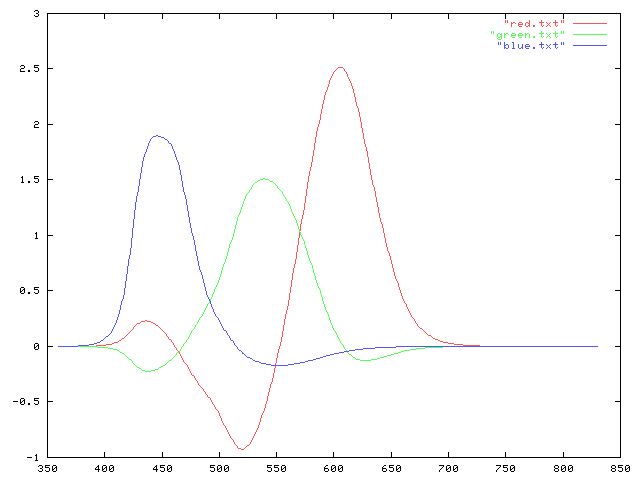 Again, relative sensitivity on the y axis, wavelength in nanometers along the x axis.